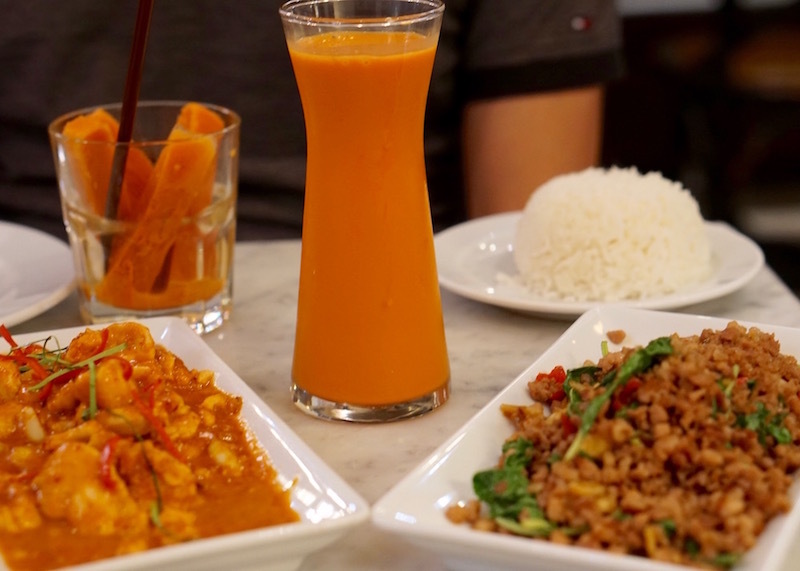 If you live in a cosmopolitan city, chances are you’ve had Thai food at least once in your life. And if you don’t have a shellfish allergy, chances are Thai food might be up there as one of your favourite types of cuisines! 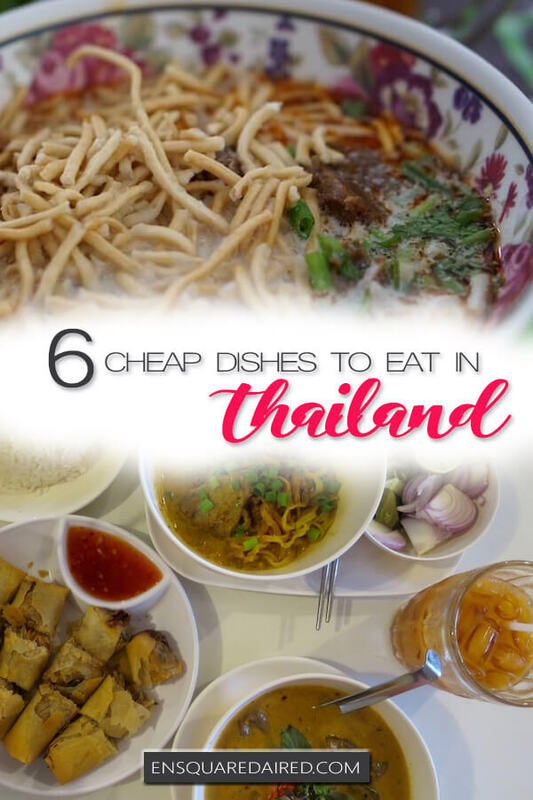 If you have never had Thai food in your life, then you are in for a real treat when you visit Thailand. 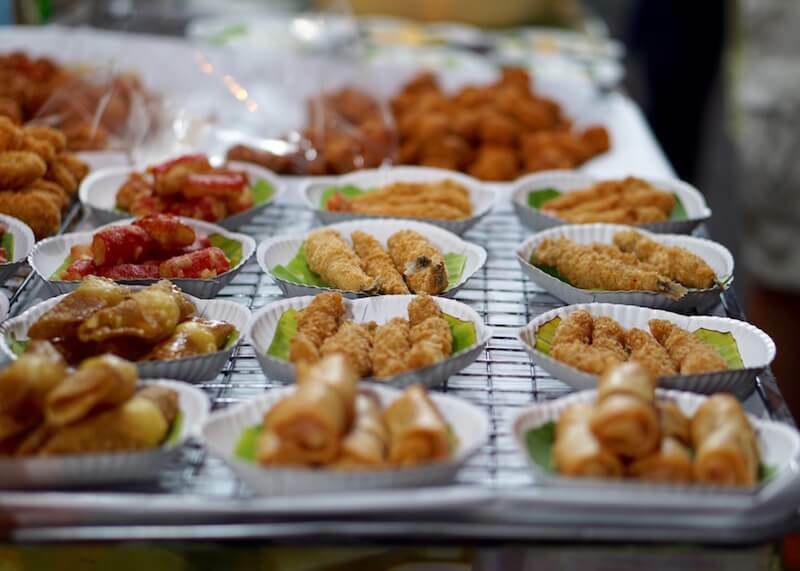 Unsurprisingly, Thailand is one of the best places in the world when it comes to food. With hundreds of meals available across the country, there’s so much to eat, the different flavours and spices are limitless. 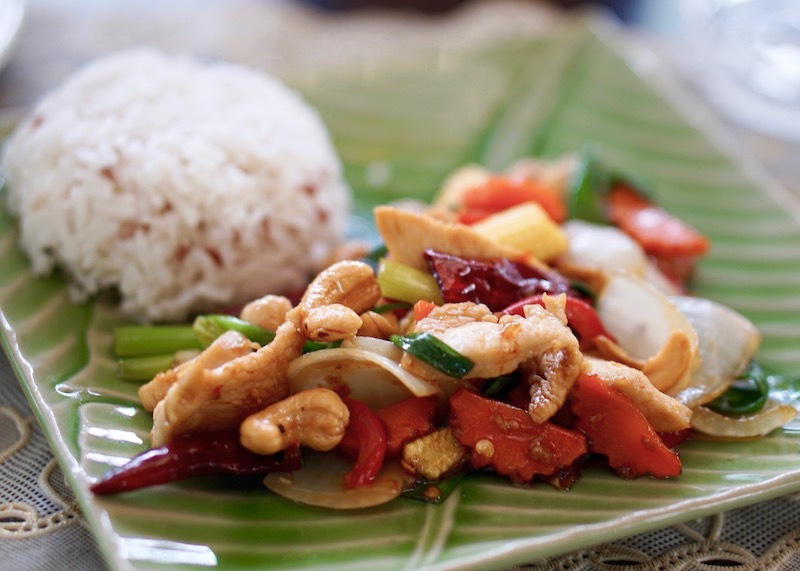 While Thai cuisine is known for being spicy, Thai food is a blend of different flavours, ranging from sweet and salty to bitter and spicy. Fresh herbs and spices are found in every dish, with influences from neighbouring countries like China, Laos, Myanmar, and Malaysia. If you’re new to Thai cuisine and don’t know where to start, these six dishes and drinks are an excellent introduction to Thai food. 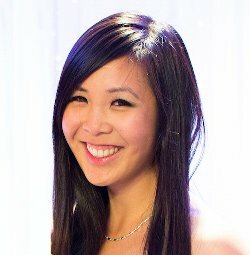 I’ve also listed prices for your reference to help you budget for your Thailand trip. Khao soi is hands down my favourite Thai dish to eat and is a must try if you are in Chiang Mai! Unsurprisingly, this spicy coconut curry noodle soup is a famous dish from Chiang Mai, Thailand’s famous city in the north. Not only is this noodle soup rich in flavour, but the history behind this dish is fascinating as well. 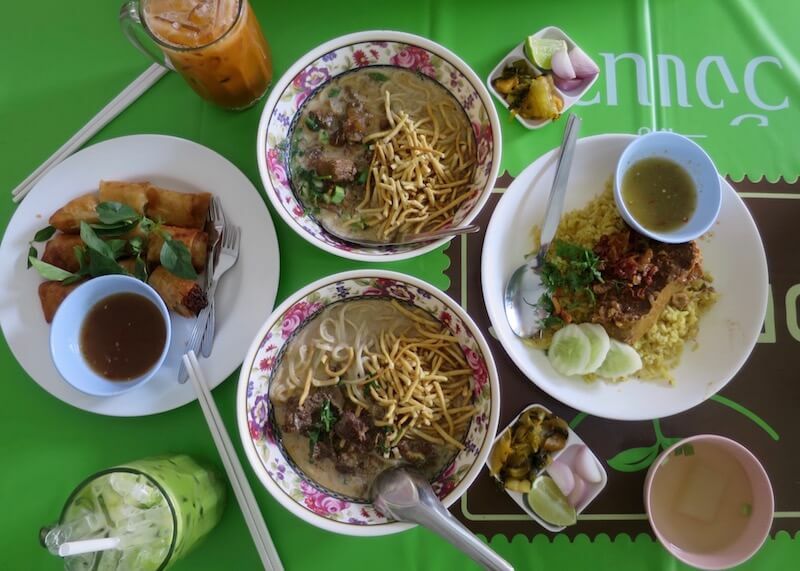 Khao soi is believed to have arrived in Chiang Mai from Chinese Muslim traders who passed through the Golden Triangle. Over time, this dish picked up some Burmese influences and so depending on who you talk to, some Thais are under the impression that this recipe comes from Burma. This dish is often served with lime, chilli paste, and pickled cabbage and often comes with flat wheat noodles and deep-fried crispy noodles. 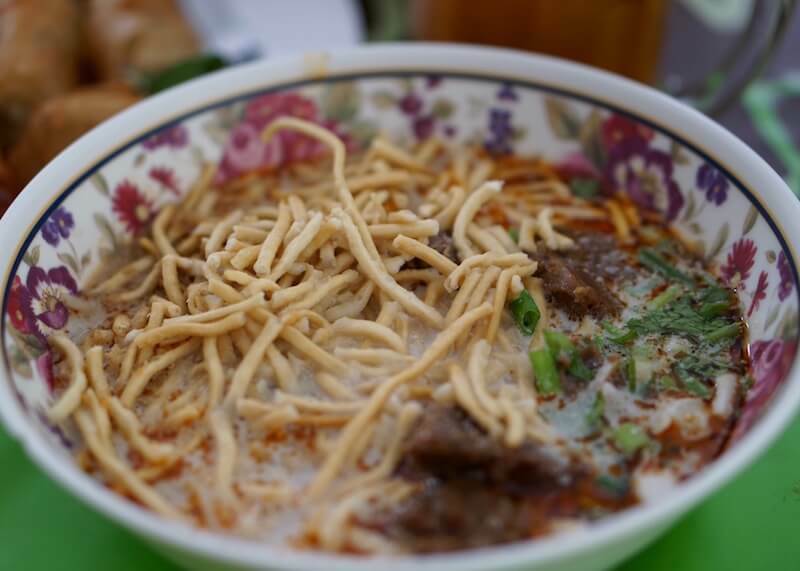 If you are in Chiang Mai, the best place to try this noodle soup is at Khao Soi Islam. 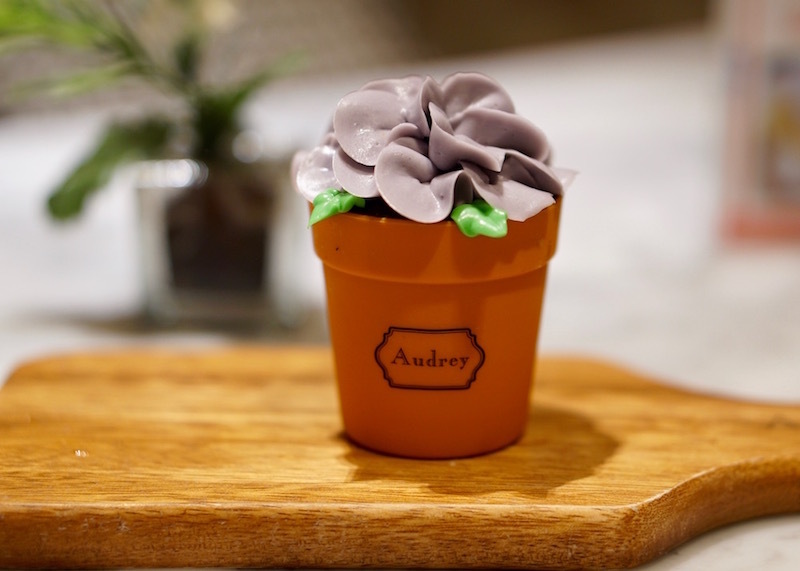 Over the years, many restaurants have modified the original recipe and have switched up the ingredients, but this restaurant is one of the few to have kept the original recipe. 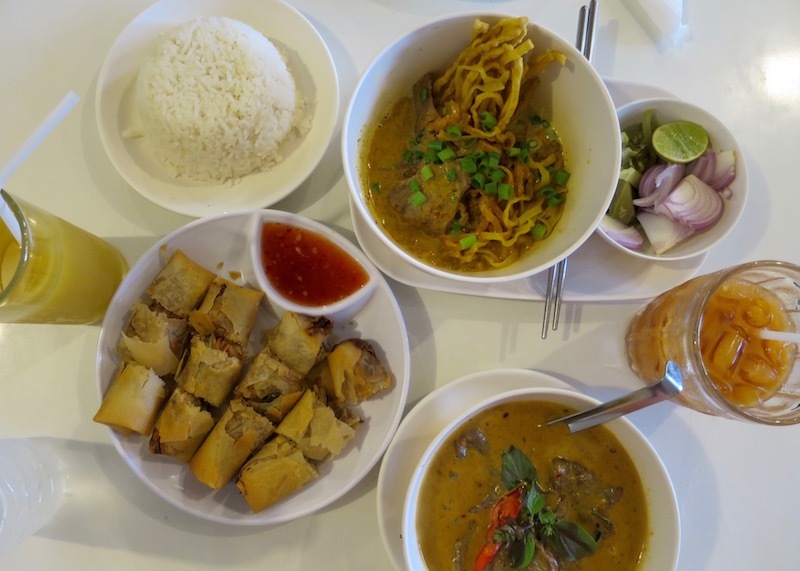 In North America, khao soi is often much sweeter and saltier and has larger portions. Not so at Khao Soi Islam. The khao soi served here is milder and not overly sweet, allowing you to taste the flavours that go into this dish. What’s also great about this place is that the dishes are quite small, enabling you to try different dishes in one sitting. I didn’t know that Thai style biryani existed until I read reviews that Khao Soi Islam serves some delicious biryani! 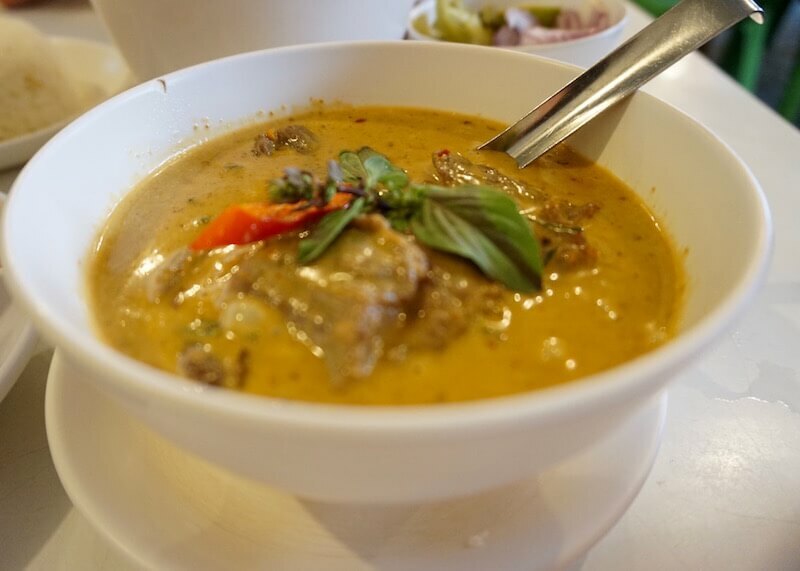 Like most delicious ethnically-fused dishes, Khao Mok is a wonderful marriage of Muslim, Indian and Thai culture. The rice is flavorful with herbs and spices, making the green chilli sweet and sour sauce a great pairing. And the meat, mmmm the meat… it was so tender and so flavourful. 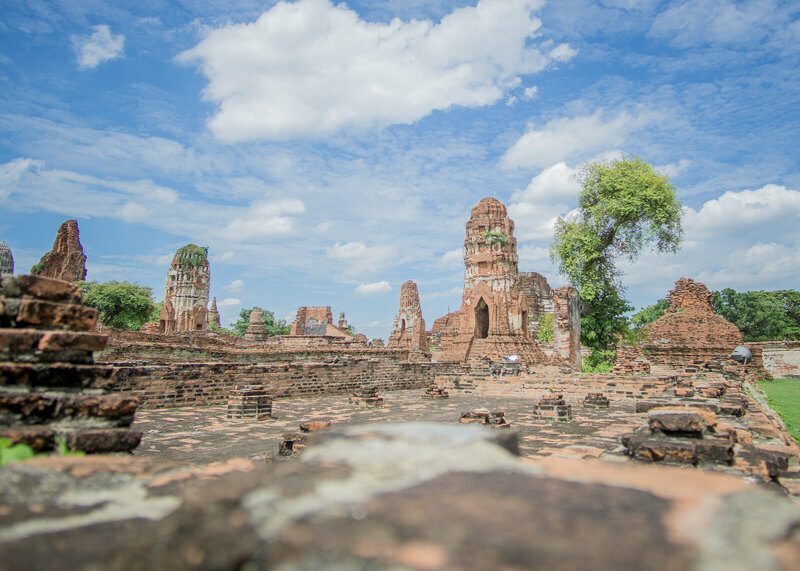 In Thailand, curry is often a staple dish for most meals and differ depending on the region. Northern Thailand tends to use more lime juice while the south uses more coconut milk. Regardless of where you order your curry, the common staple ingredients in all curries are coconut milk and chilli peppers. Green curry: Green chillies are the base ingredient, giving it a green colour and is sweeter thanks to the coconut milk. Red curry: This type of curry is red (and spicy!) because red chillies are the base ingredient. While still spicy and sweet, Thai red curry tends to be more savoury in relation to the other curry dishes. Yellow curry: The base is yellow thanks to the turmeric and cumin base. Yellow curry tends to come in different forms, depending on which region of Thailand you are visiting. Paneang curry: Paneang curry originated from Thailand and is quite popular in the central region of the country. This type of curry is a bit milder and subtly flavoured and doesn’t have a base ingredient. Rather, the main ingredients include shrimp or fish paste, peanuts, kaffir lime leaves, and other combination of ingredients. Massaman curry: While other Thai curries are from Laotian curry influences, Massaman curry is influenced by Indian curry and is popular in central and southern Thailand. Red chillies, cumin, and fish sauce are some of the main ingredients in this dish and is thicker in comparison to the other curries. For as long as I can remember, green curry was my favourite go-to whenever I ate Thai food. That all changed after I took some cooking classes in Chiang Mai and learned how to make panang curry. The best curry I ate (besides the one that I made! Haha…) came from Lemongrass restaurant, a popular Thai restaurant in Chiang Mai. 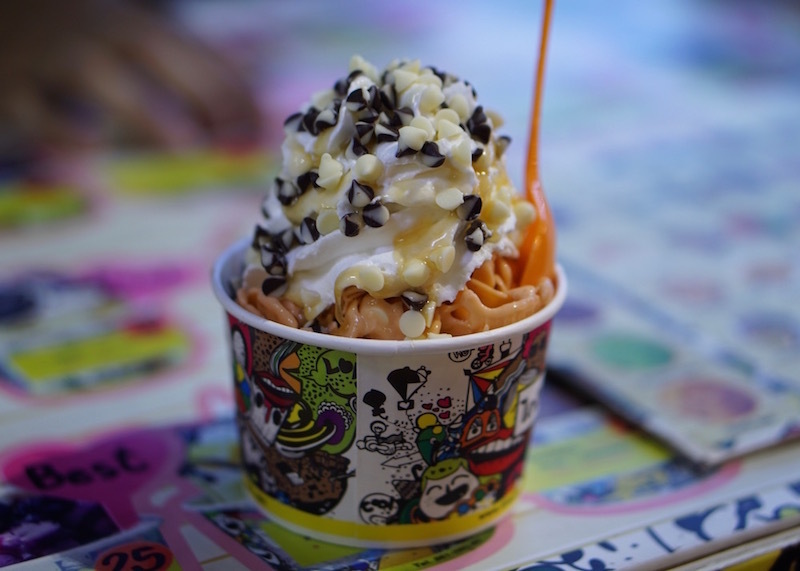 Thai milk tea is so delicious and sweet that I often had it as my dessert while I was in Thailand. This drink is much more concentrated and flavorful in comparison to regular iced tea. The essential ingredients for this drink black tea with star anise, crushed tamarind seed, and orange blossom water. Condensed milk and sugar are then added to sweeten the drink. 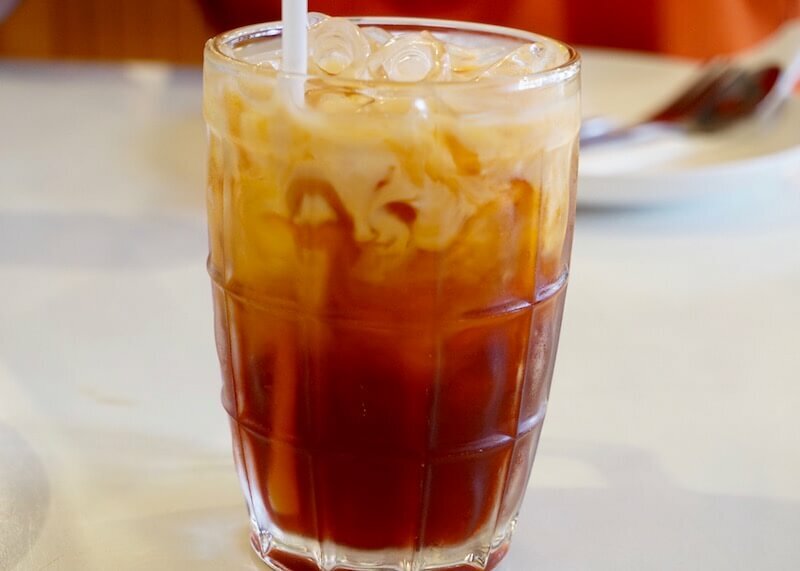 Thai milk tea is ubiquitous and can be found everywhere; in restaurants, stalls, and even 7-Eleven stalls. I gotta warn you, though, the tea from 7-Eleven are overly sweet and need more ice to dilute the sugar. 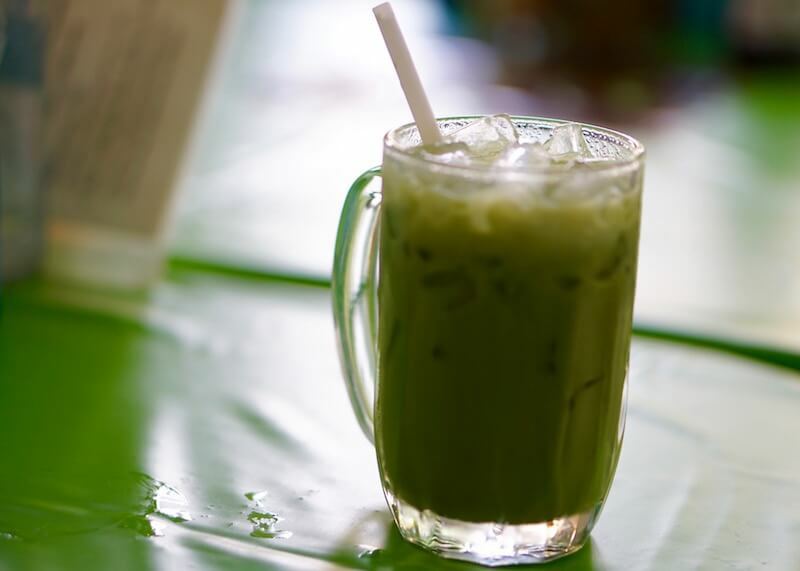 While we are familiar with trying Thai black milk tea, did you know that Thai green tea is just as good as Thai milk tea? I didn’t! Discovering Thai green tea was an accidental discovery for me; I was expecting regular, unsweetened green tea when I ordered this drink but instead, got something that looked like the previous photo. This drink is so yummy! Before this drink, I did not know Thai green tea tastes this good; I just thought green tea is green tea. You know, like the Japanese, unsweetened, good for a let’s-finish-off-a-heavy-meal-type green tea. Well, I was in for a lovely surprise when I got this drink instead. The taste is pretty unique, but has a strong green tea taste to it and made it very enjoyable! Thai tom yum goong made by…moi in a Chiang Mai cooking class! Are you impressed? 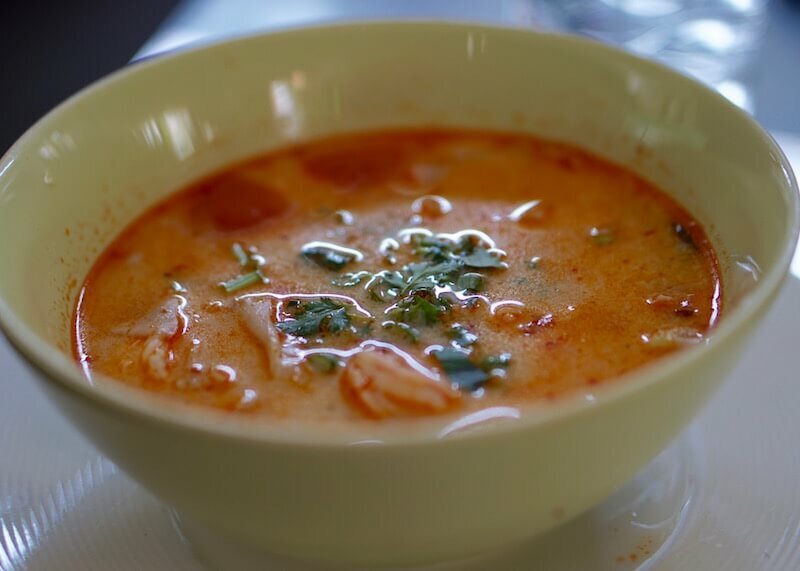 Ah, the perfect soup to try as an intro to Thai cuisine! This soup has a distinct hot and sour taste due to its blend of lemongrass, chilli, lime, fish sauce and galangal spices. Often, you will find this soup served with mushroom and shrimp. 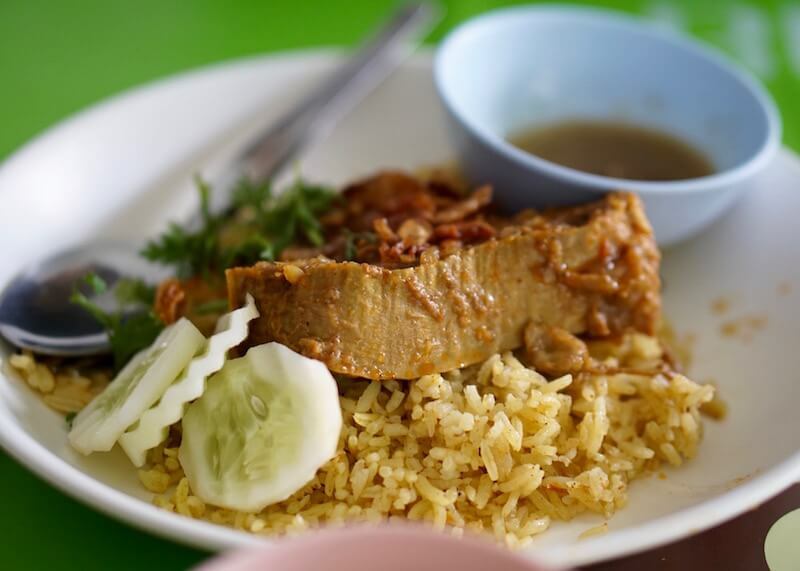 Well, there you have it, my food guide to the top six things you must try in Thailand. Navigating Thai food is like a landmine because there are so many options within each dish that it gets darn confusing. 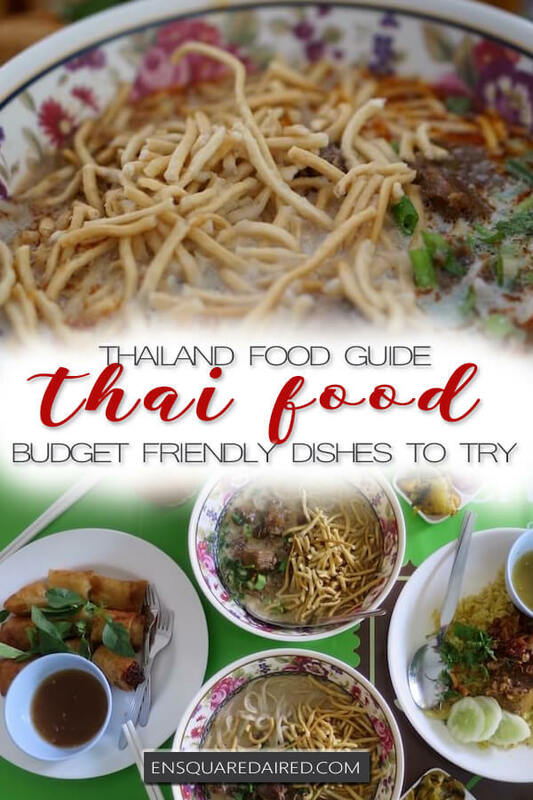 Not to worry, these dishes will suit any taste bud and is an excellent introduction to Thai food. This Is What Nomad Living Is Like In Amazing Thailand Chiang Mai Street Food | 7 Affordable Dishes You’ll Want To Try Some Of The Best Desserts To Try In Chiang Mai 9 Of The Most Delightful Food To Eat In Bangkok The Best Desserts In Bangkok That Will Make Your Trip Sweeter You Will Love Zabb E Lee’s Terrific Chiang Mai Cooking Class Why Cooking Love In Chiang Mai Is So Popular What is the best way to get from Bangkok to Ayutthaya? Yes please to all ot it. Yum!